Sunday Catch Up - Are Oreo Dairy Free? How's the Christmas shopping going? Would it annoy you if I said mine was all finished at the start of the month and wrapped? Not much has happened in Sugarpuffishland this week. It has been work, moaning about the cold, then complaining about my eczema. I like food, I like junk food but I also balance it out with the healthy stuff. When you have allergies it nice to find a treat that is not on the free from shelf. Especially since much of that stuff is Gluten Free and I do not need to avoid gluten. It makes you feel for a spilt second that you are normal again. 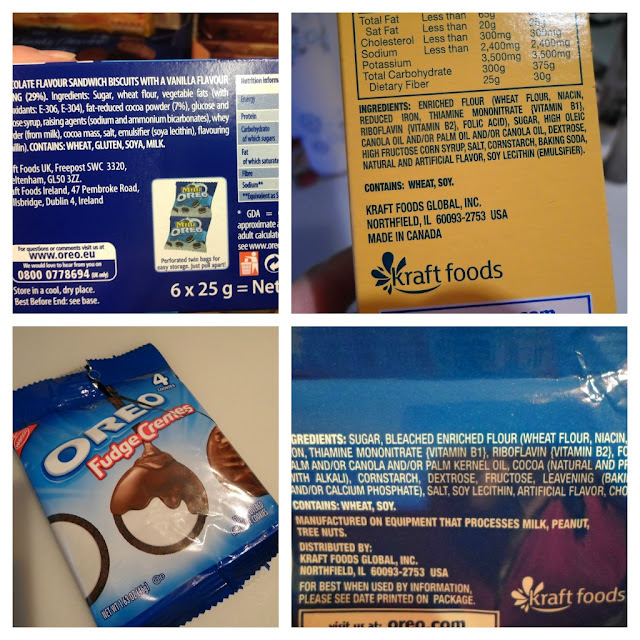 Did you know that American Oreo are milk free but Oreo made in UK contain milk? Sounds very silly but I finally solved the puzzle of how I was able to eat these cookies in America but not the UK. It had been a while since I visited the US and I thought the recipes had changed. The mystery was solved because I went to an American Candy store and was browsing the different variety flavour oreo, I noticed I could eat them. Then out of curiosity I checked the ingredients on the packets selling at Tesco. To add to the excitement the American candy store was selling Oreo Fudge Cremes. No one believed me on twitter they were milk free so here is the proof (pictured above).